There’s nothing like a good family fight that ends up in court. If, that is, you can understand the lingo used in the court documents. 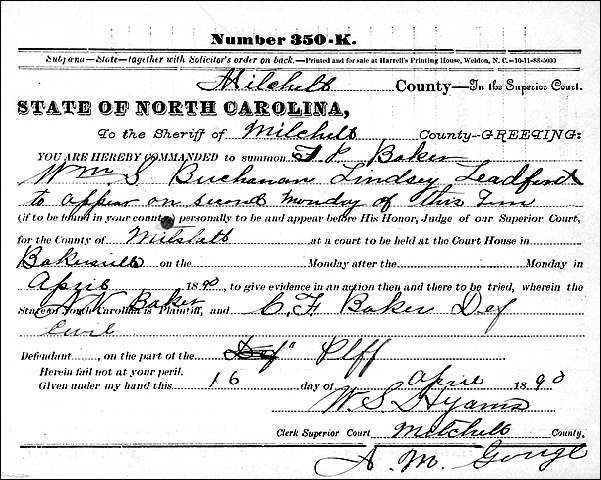 There’s almost always genealogical information of value tucked away in the records — in the case of The Legal Genealogist‘s Baker family, information about the offspring of a third great grand-uncle Josiah Baker of Bakersville, Mitchell County, North Carolina. But oy! For a non-lawyer, reading the court file could be painful. Josiah, who died in Bakersville in 1881, had seven sons — but two (William and David) died in childhood and three (Newton, John and Joseph) died in the Civil War. Only two — Theodore and Charles — survived him. But Newton had had a son before he died,1 and therein lies the tale. 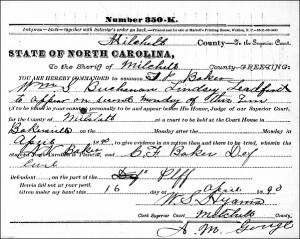 Newton Vance Baker was the son of Josiah’s first-born, Newton A. Baker and his wife Hannah Ledford.2 And in 1884, he sued his Uncle Charles over a land deal. The hitch was that, by 1884, Charles hadn’t paid the whole purchase price, the seller of the Dogwood Flats was in court trying to get the land back, and Vance was caught in the middle. So he sued. “The terms in parol”? Say what? Yep. To exactly understand what Vance was arguing, we need to understand yet another of those murky “why-won’t-they-just-speak-English” terms lawyers use. In this particular case, the court papers don’t ever mention any writing, so in context it’s clear that this was one of those “not worth the paper it wasn’t written down on” handshake deals. Had there been any written evidence that the side agreement existed, it would have been one of the exhibits submitted to the court — and there was no such exhibit. Doesn’t look like he kept that land at all. That’s my goal, Gus! Thanks for letting me know I met it for today! Interesting distinction between parol and parole! Was there any explanation in the case file why Josiah didn’t just gift the supposed extra funds directly to Newton Jr.? Also, if Charles had the funds from Josiah, and they weren’t used as intended, shouldn’t Charles have been in trouble on that count too? There are lots of possible reasons: the big one may be that there wasn’t any cash in the house, just land, with the cash in the hands of the younger crowd. It may also be that Josiah thought Vance would blow through cash but couldn’t (or had reason not to) split his own existing lands to give Vance a part. And, of course, Vance might not have been telling the truth in his lawsuit at all. Well, I hope that Vance could lead a full and satisfying life without that land. Thanks for explaining all the legal variations of “parol.” Heh. I remember learning about “parol promise” in the old TV series with John Houseman, about law students. “The Paper Chase.” Loved that series. It’s been a while since The Paper Chase! Good for you for remembering it.